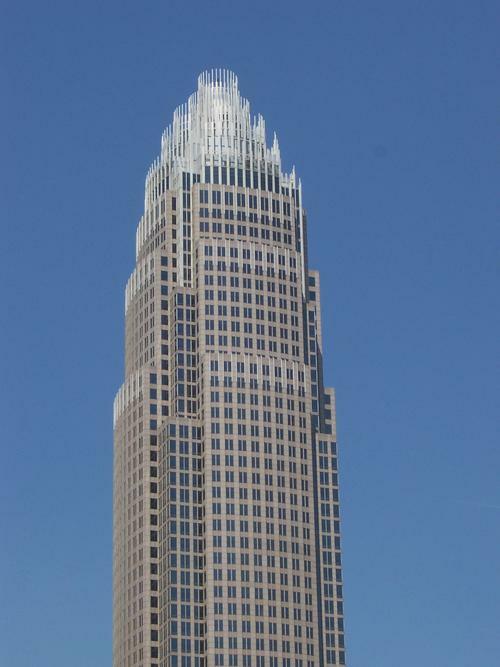 The Bank of America Corporate Center is an 871 ft (265 m) skyscraper in Uptown Charlotte, North Carolina. 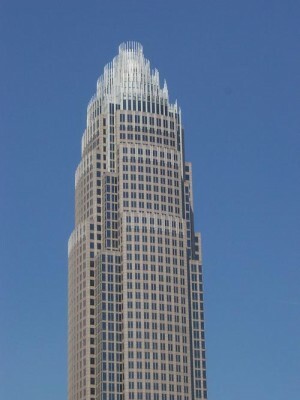 When completed in 1992, it became and still is the tallest building in North Carolina as well as the tallest building between Philadelphia and Atlanta, Georgia; it is 60 stories high. It is the 76th tallest building in the world. Designed by Argentine architect César Pelli and HKS Architects, it is the 24th tallest building in the United States and is the most widely known building in the Charlotte skyline. Sometimes locally referred to as the Taj McColl after then North Carolina National Bank (NCNB) chairman Hugh McColl who was responsible for the tower's construction, on a clear day the tower is visible to the naked eye from 35 miles (56 km) away. On Wednesday, December 10, 1986, NCNB announced that it would be constructing what would become the Corporate Center. Jointly developed with Charter Properties, the project was initially announced as a 50 story tower to be constructed with a 350 room hotel and what would become the North Carolina Blumenthal Performing Arts Center. The initial design for the 50 story tower was created by Charlotte based Odell Associates.